Feeding a Cane Corso puppy properly can be a daunting task. A healthy Cane Corso adult can weight well over 100 pounds. That’s a lot of ground to cover for a young pup. That being said, it’s imperative that owners supply puppies of this breed with a healthy diet. As with all large breeds, your Cane Corso will need plenty of food, but you’ll also want to avoid overfeeding and bad feeding habits. Here, you’ll find information on how much to feed, how often to feed, what to feed and in what way to feed Cane Corso puppies. Many people choose to change food brands when they bring home a new puppy. While this is often necessary, there are certain precautions you should take to avoid any undue stress on your pet. Unlike humans, dogs don’t really start to chemically digest food until after they’ve swallowed. A dog’s saliva is mainly there to lubricate the esophagus and kill bacteria rather than break down food. This means that far more food textures make it into the canine digestive system, which results in a higher sensitivity to food variations. When changing dog food, the first thing to remember is that switching food brands suddenly can cause digestive issues, especially in puppies. To make the transition easier, you need to gradually mix in the new food with the food from which you are switching. Of course, to do this, you’ll have to communicate with whoever you are getting the puppy from. Breeders will often even send you home with a supply of your new puppy’s old food. Some canine authorities even suggest keeping your puppy on this food for up to two weeks since this is already a stressful period of change. When you do start swapping foods, start with a ratio of about twenty-five percent new food to seventy-five percent old. Gradually increase this amount over about a week until you completely phase out the old food. You’ll also want to do this when you switch to adult dog food and eventually senior food. We understand that this system may not be possible for everyone–dog foods can be recalled, shelters can have special suppliers, etc. However, there are still things you can do to help minimize digestive issues in your puppy when changing foods. Ask your veterinarian about introducing a digestive supplement to your dog’s new food if you aren’t able to mix it with their old brand. Even if you can mix, this may still be a good idea for your Cane Corso puppy. Please be aware that adult dog supplements can be toxic to puppies. So, when we say consult a veterinarian, we mean it. It’s important that you monitor your dog closely any time you switch foods. If your dog develops digestive issues like diarrhea, vomiting or constipation when changing foods, consult a veterinarian as soon as possible. From six to twelve weeks, the AKC recommends feeding puppies four times a day. However, from three months to six months ACK suggests reducing this to three times per day. By the time he or she is six months old you can feed your puppy twice a day. Portions are by no means an exact science. You’ll need to pay close attention to your puppy and consult with your veterinarian to really understand how your Cane Corso puppy’s portion requirements will change. In general, their portions will increase greatly from one month up until about two years (see How Much Should I Feed My Cane Corso Puppy for more). Your puppies nutrient needs will stay largely the same until adulthood. However, at around fourteen weeks old your puppy will start to need less protein according to the Merk Veterinarian Manual. Each breed of dogs has different dietary needs as does each stage of a dog’s life. For a Cane Corso puppy, you’ll find everything you need in this section to know to select a dog food brand. We also highly recommend checking with your veterinarian before starting a new food. Several detailed scientific studies have been done on the best food formulations for large breed puppies. According to one study, you can promote proper growth and reduce deformations in skeletal growth by feeding your large breed dog the following formula. In order to capitalize on this formula, .75 to .95 percent of the total food weight should come from calcium, and .62 to .72 percent should come from phosphorus. These are included in the minerals portion of the listed food weight percentages above. Another study, suggests that all dogs need between .9 and .23 percent calcium to ensure their bones develop properly as they grow. The Association of American Feed Control Officials recommends 1.0 to 2.5 percent calcium, and the National Research Council recommends 1.2 to 1.8 percent calcium. You’ll want to pay close attention to these calcium recommendations as you select a puppy food for your Cane Corso since this breed grows to be quite large. Large breeds are far more prone to growth-related skeletal deformations, which means they will actually need less calcium, phosphorus and vitamin D than normal breeds. For this reason, we recommend between .95 and 1.2 percent calcium by food weight for Cane Corso puppies. The products recommended in this article were chosen considering this information. While this may seem like a lot of thought, a proper diet is absolutely essential to keeping your big, lovable Cane Corso happy and healthy. There is nothing better than the grateful cuddles of a healthy pup. 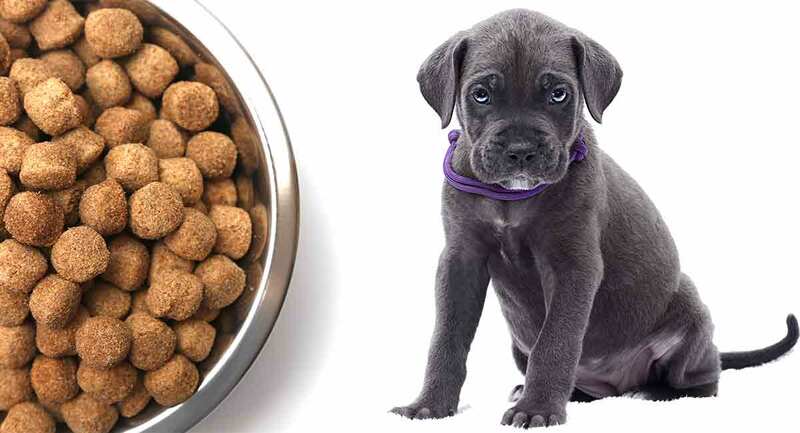 Feeding a Cane Corso Puppy Kibble is a popular option. But it is a good idea to note puppy kibble’s pros and cons. You should have some puppy wet food available in case of emergencies any time there is a puppy in the house. You can more often get a puppy to eat wet food when they otherwise won’t eat. Feeding your pet a raw diet has benefits and drawbacks. You can find both below. If you really want total control of your puppy’s diet, you can create a homemade diet for your pet. If you choose to do this, you’ll need to be very careful and highly educated. There are amounts of nutrients that puppies absolutely must have. Without them, your Cane Corso won’t be able to properly develop. Commercial puppy food products, regardless of their overall benefits and issues, are carefully formulated to have these required nutrients. How Much Should I Feed My Cane Corso Puppy? Puppies, especially large breeds, require a huge amount of energy to grow. At four months, it will need 2 ⅓ to 3 ¼ cups. By six to eight months, it will need 3 ⅓ to 5 ½ cups of food. From nine to eleven months, your puppy will likely need 4 ½ to 6 cups. Then, at one to two years of age you’ll need to feed your dog 6 ½ to 9 ⅓ cups of food. It should be noted that these amounts will vary between puppies and brands. You should also note that puppies who eat more grow faster. Because of this, some people try to overfeed their puppies. Never do this. If a puppy grows too fast, it can increase their likelihood of joint problems, skeletal deformations and other complications. Puppies will eventually reach adult size as long as you feed them appropriately, so there is never a reason to overfeed to promote growth. This is a particularly tricky question. Weights will vary a lot puppy to puppy, from metabolism to metabolism. Their healthy weight range will also change as they age. The best way to answer this question is to see a veterinarian. For a quick reference, you can use this Happy Puppy chart. Your Cane Corso will fall into the large breed size. So, from zero to six months your puppy should gain about eight to ten pounds per month starting at one pound. From six to twelve months, they should gain about two to three and a half pounds per month. After that, they will gain a little over a pound per month until adulthood. In the event they stray too far from their healthy weight, your dog can end up with serious health issues. If your puppy is too skinny, it will not have the energy and nutrients needed to develop properly. If your puppy is overweight, it will put undue stress on his or her bones and joints. They may also develop serious heart issues as they get older. As a rule of thumb, you should be able to feel your puppy’s ribs but not see them. From above, they should have a visible waist. Large breed puppies will not control portions on their own. It is very normal for dogs to still seem hungry following a healthy meal. If your veterinarian gave you a meal plan, you shouldn’t alter it just because your puppy seems hungry. In fact, I had a funny pup that would follow me around, looking back at his food bowl longingly, after every meal. While it is hard to remain firm when faced with puppy dog eyes, it is something all dog owners must learn. You may consider adding in a feeding puzzle to slow your Cane Corso puppy down. This is also beneficial since Cane Corsos are a very intelligent breed that will need some mental stimulation. If you think your puppy might need more food, keep track of his or her weight and then report back to your veterinarian at your next visit. However, if your puppy seems perpetually hungry and grows skinny, it may have intestinal worms. If you suspect that your puppy has worms, seek veterinary assistance as soon as possible. While this is not always serious, large breed puppies should have a healthy appetite. It could be that there are several minor changes you may need to make. That being said, a couple of major things could potentially be wrong. It may be that your puppy is not ready for dry food. If it has been an entire day since your puppy last ate, try some wet food. This often does the trick. Your puppy may also be teething, which could cause him to react negatively to certain textures and flavors. Again, you may consider wet food as a temporary solution. Sometimes, simply adding warm water to their food will make the meal more appealing to your Cane Corso puppy. It is also possible that your puppy may have a more serious illness. There’s no need to panic if your puppy won’t eat, but you should consult a veterinarian as soon as possible. How Long Is A Cane Corso Considered A Puppy? Large breeds like the Cane Corso can take up to fifteen months to reach adulthood. Continue feeding them puppy food until their body has matured. If you aren’t sure whether your puppy is ready for the switch, it is best to continue feeding them puppy food. It is far better to feed an adult dog puppy food than to feed a puppy adult food. Your vet will know for sure when they are ready. Feeding A Cane Corso Puppy can take a lot of careful consideration. Have you been tempted by those puppy dog eyes to reach for the treat? Let us know in the comments! Larsen, J. “Feeding Large-Breed Puppies.” University of California Davis. 2010. Sanderson, S. L. “Nutrition Requirements and Related Diseases of Small Animals.” Merck Veterinary Manual. Lepine, A. Reinhart, G. “Pet food composition for large breed puppies and method for promoting proper skeletal growth.” 1997. Ehrlein, Hans-Jörg, and J. Pröve. “Effect Of Viscosity Of Test Meals On Gastric Emptying In Dogs.” Quarterly Journal of Experimental Physiology. 1982. Kidd, Randy. “The Canine Digestion Process.” Whole Dog Journal, Whole Dog Journal, 1 Mar. 2005. Lauten, Susan D. “Nutritional Risks to Large-Breed Dogs: From Weaning to the Geriatric Years.” Veterinary Clinics of North America: Small Animal Practice. 2006. Riser, W. “Normal and Abnormal Growth of the Distal Foreleg in Large and Giant Dogs.” Veterinary Radiology. 1965. Strohmeyer, Rachel A., et al. “Evaluation of Bacterial and Protozoal Contamination of Commercially Available Raw Meat Diets for Dogs.” Journal of the American Veterinary Medical Association. 2006.